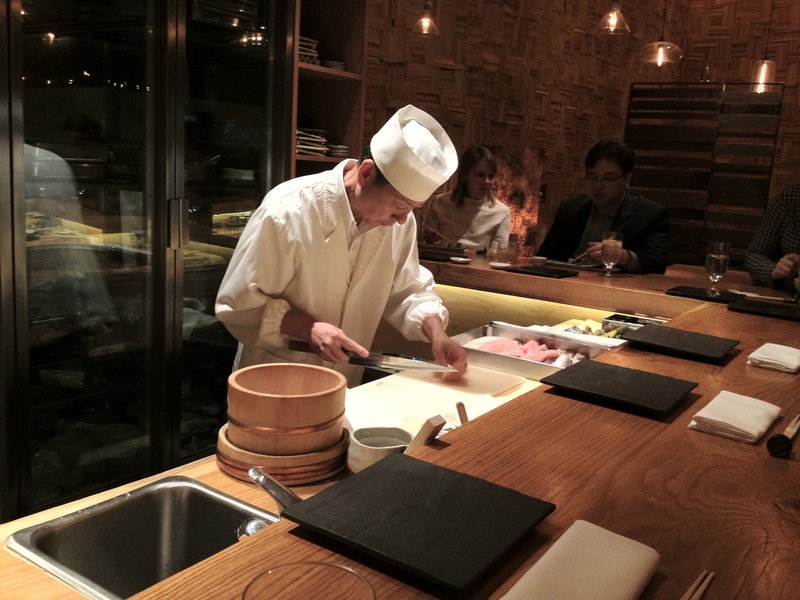 I’ve been wanting to try this sushi bar–only restaurant for a while now. It’s in a more private dining area than the main dining area of Brushstroke, and there’s been a lot of hype around this restaurant. Reservations are pretty hard to get for this place right now, and there are only 16 covers a night (two rounds of eight). There was a pretty large selection of fish, and apparently the vast majority of the fish gets shipped from Japan every few days. Everything was really fresh and high quality. Chef Ichimura had the usual choices (tai, saba, otoro, kohada, uni, and so on), but it was nice being able to try kuromutsu (black bluefish), higetara (a type of cod) , shirasu (baby anchovy), and shiraou (icefish). The rice was soft and fluffy, though I like the sushi rice more at a few other places in NYC (like Yasuda). On the negative side, it started off too warm at first before finally getting to a good temperature (just sliiiiiiiightly above room temperature). 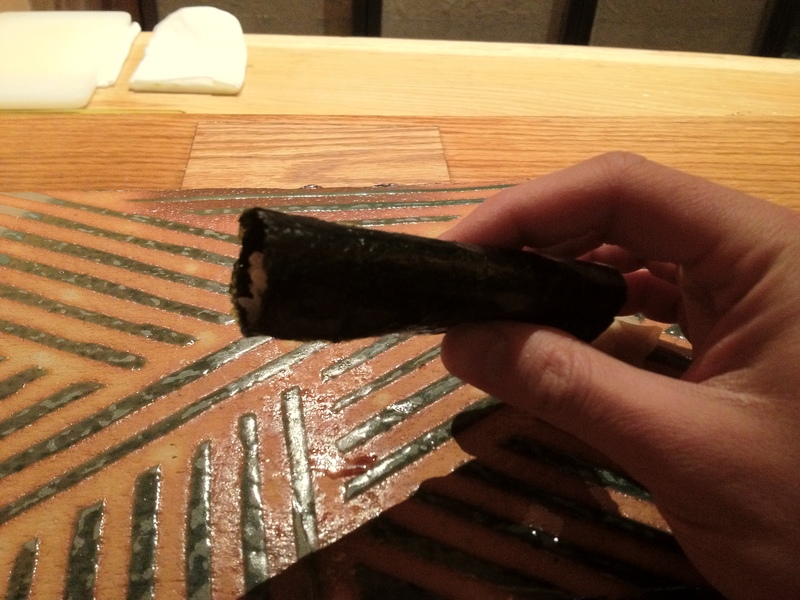 -The anago, akamutsu, kuromutsu, tai, and uni were really good. -The ōtoro and chūtoro were AMAZING. Winter is a great time for toro haha ^_^. 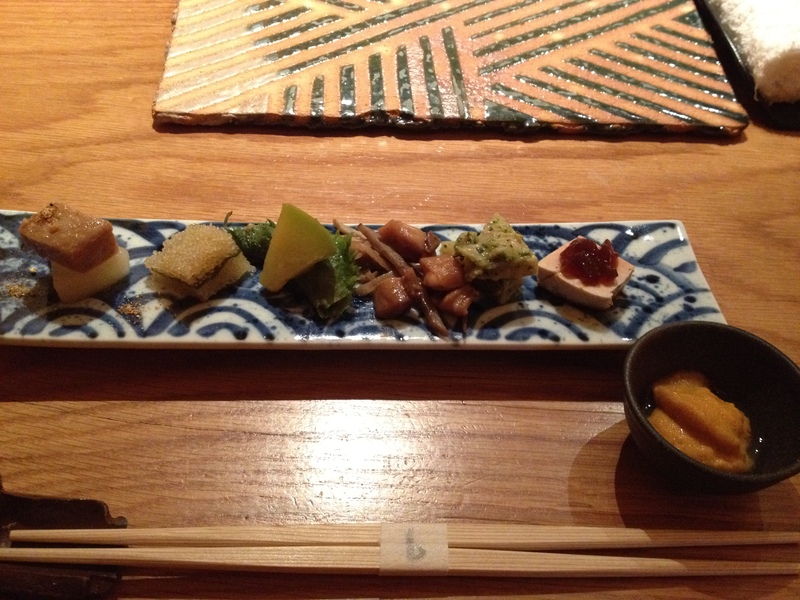 -The one disappointing part was the tamago, which didn’t taste special at all. I had a really good time here, and I thought the meal was really well-priced for what you get. The value to quality and quantity ratio is REALLY good here for sushi! Chef Ichimura is also REALLY nice. That might have helped haha. Chawanmushi with black truffles, crab meat, chives, and fresh ginger. There wasn’t too much egg in this chawanmushi, but the egg portions definitely worked well with the crab portions. The black truffles, chives, and fresh ginger added some nuance and complexity to the dish. 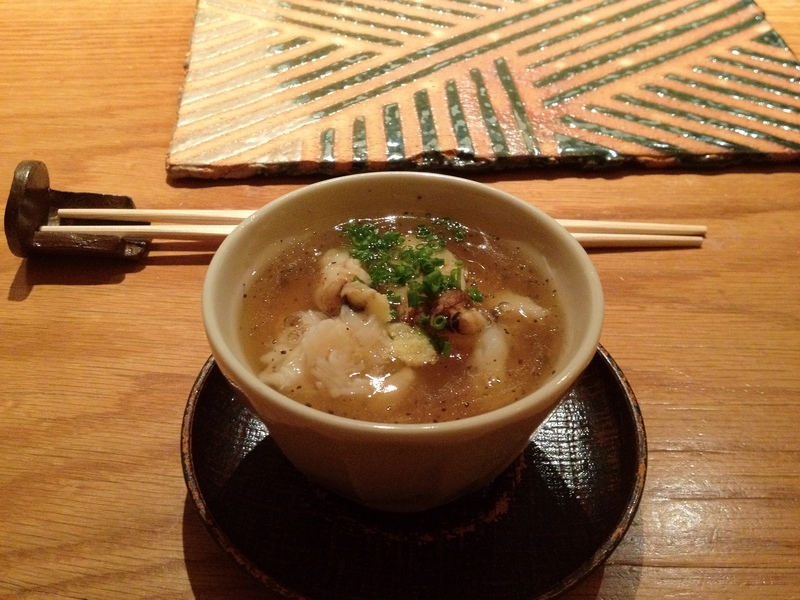 At the same time, while this was good, I’ve had better chawanmushi at quite a few places. 2. 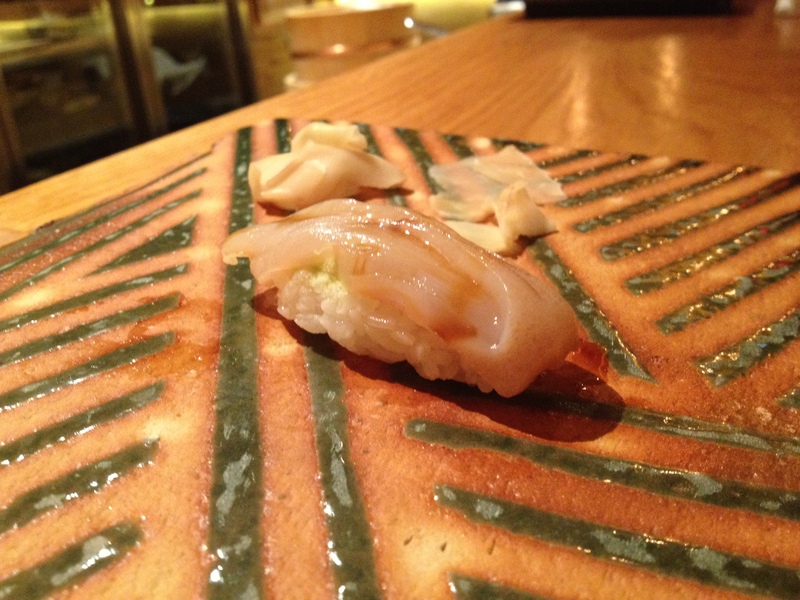 Ankimo (monkfish liver) with ponzu sauce. 3. Bamboo shoot with.. something. 4. 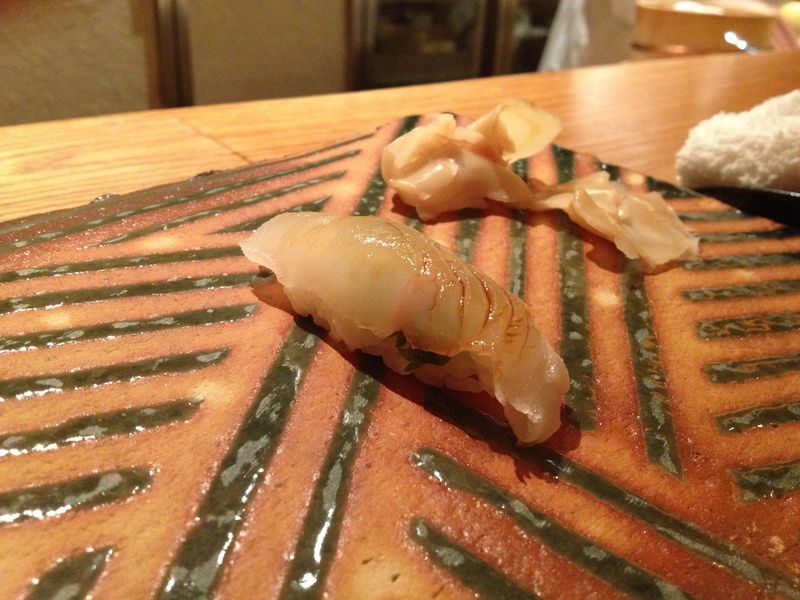 Himejako (giant clam) with sansho pepper from Kyoto. 5. 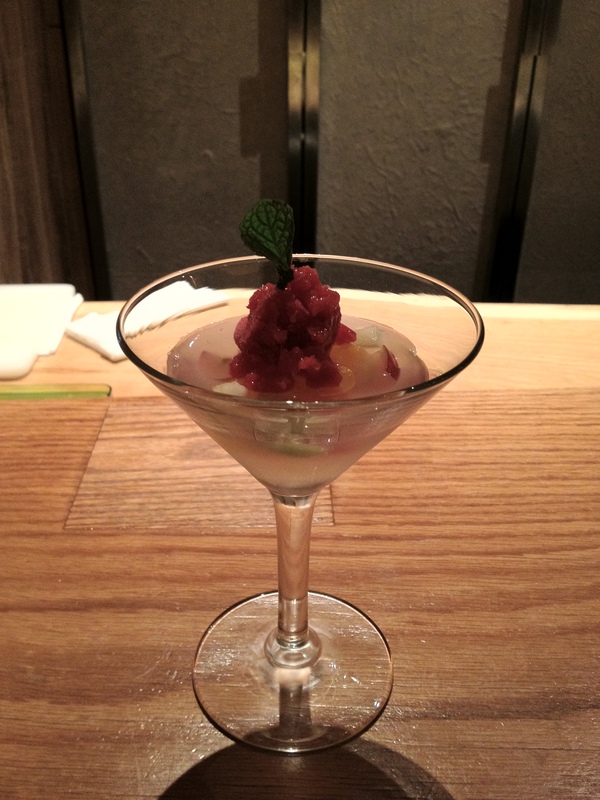 Marinated tuna with shiso and… something. 6. Herring roe with shiso. 7. 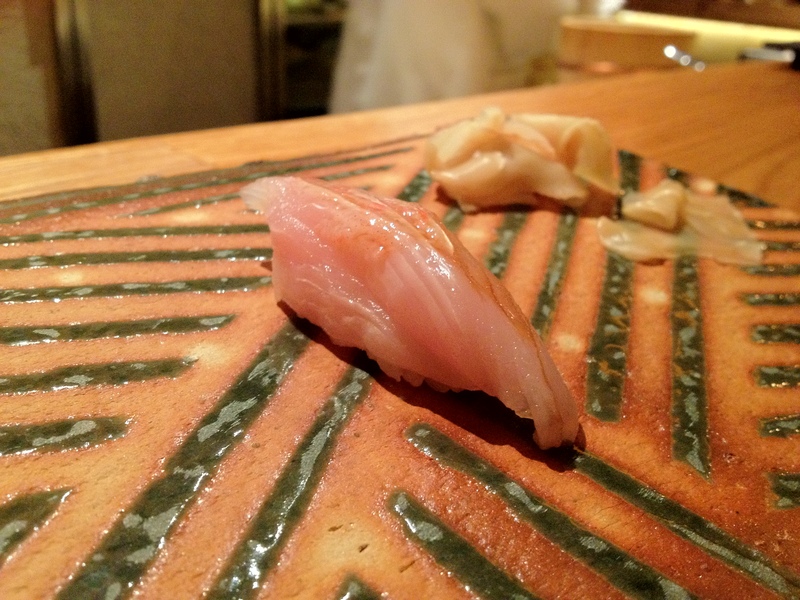 Toro with miso and ginger. 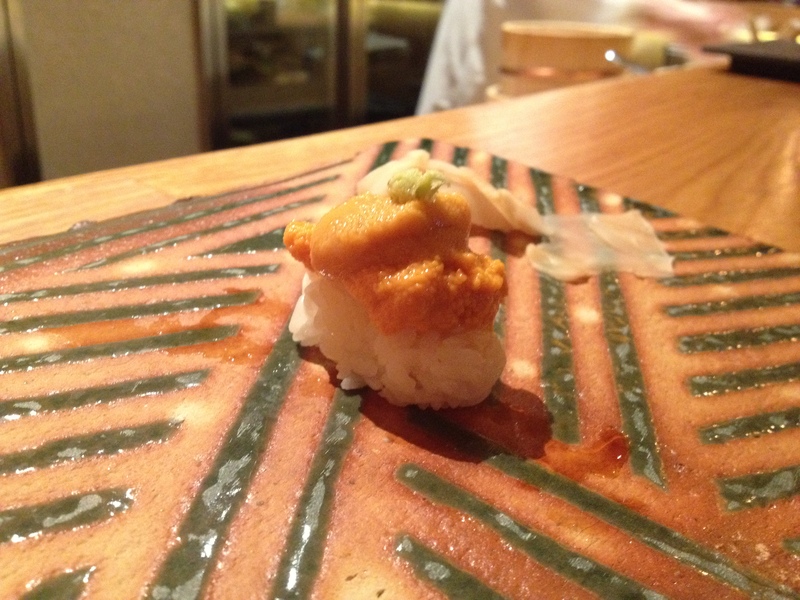 -The uni was very sweet and fragrant (as I’d expect). 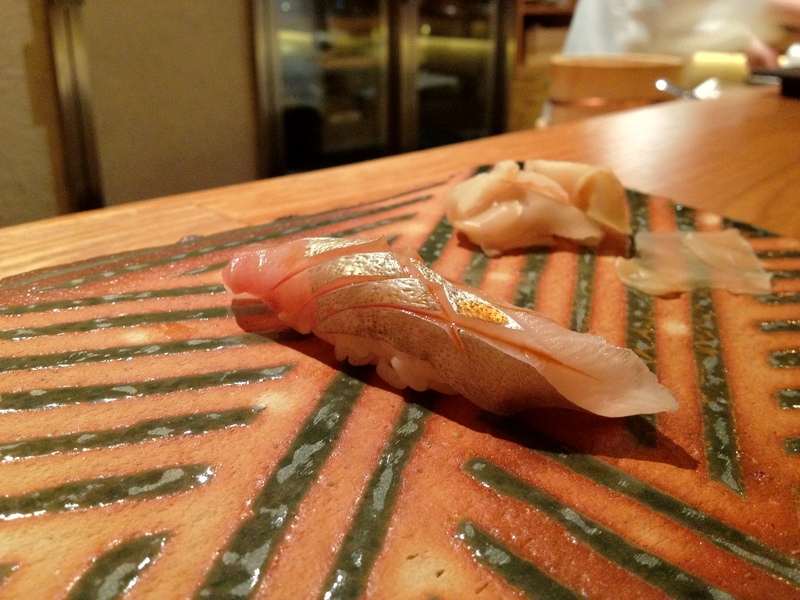 -The ankimo was good and creamy, but I still liked the ankimo I had at Sushi Yoshitake in HK and Tenku Ryugin in HK more. 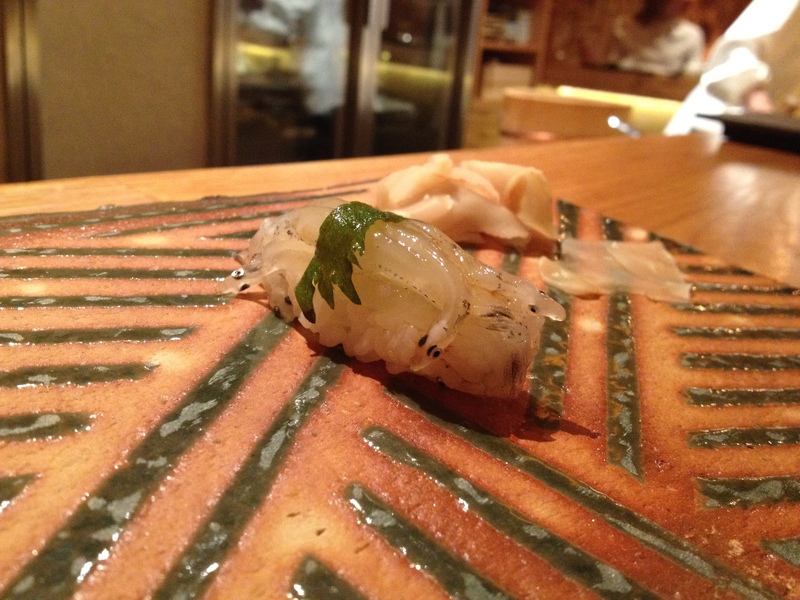 -The himejako with sansho peppers was delicious, but I think I would’ve liked the clam with or without the peppers–they felt a little unnecessary. -I didn’t really enjoy the herring roe. Maybe it’s an acquired taste. 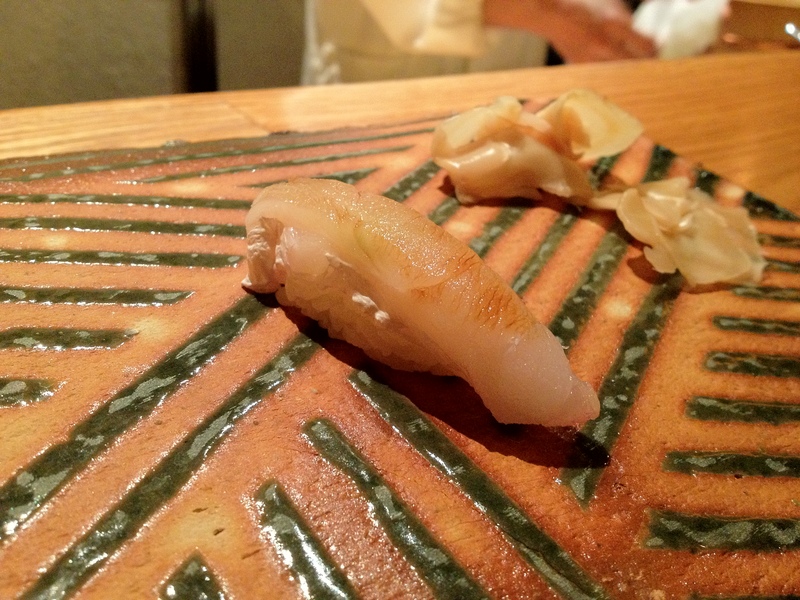 -The toro melted in my mouth and was amazing (as expected, though–it wasn’t anything new). 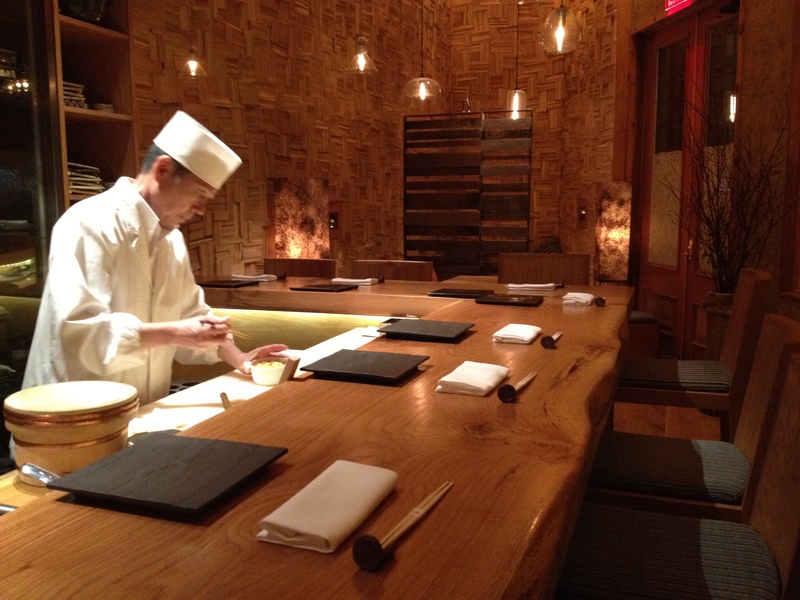 Chef Ichimura’s preparing sushi here. The rice is fluffy but REALLY warm. The hirami was solid. 2. Higetara (a type of cod). Hmm, the rice is better. Temperature is right, and still fluffy! The kinmedai was good. 4. 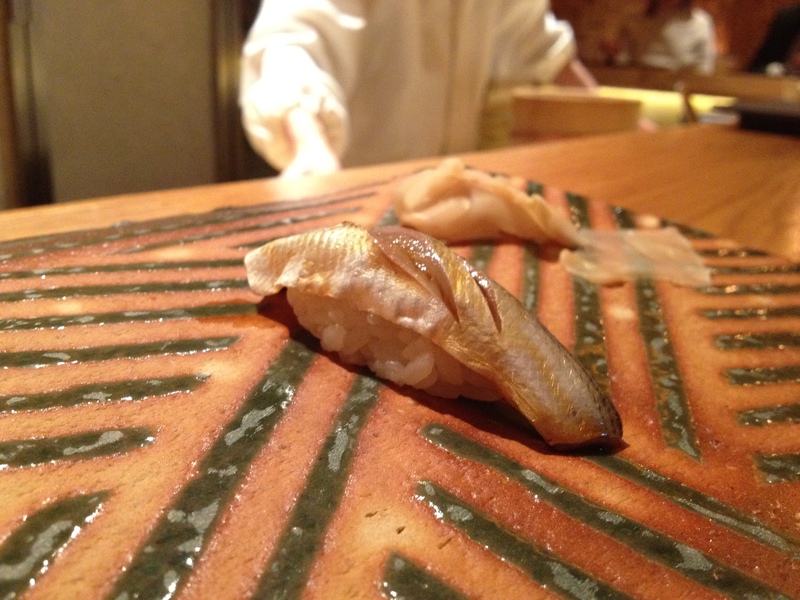 Shirasu (whitebait or baby anchovy) from Kyushu. It was a little fishy but was still really pleasant to eat and easy to enjoy. 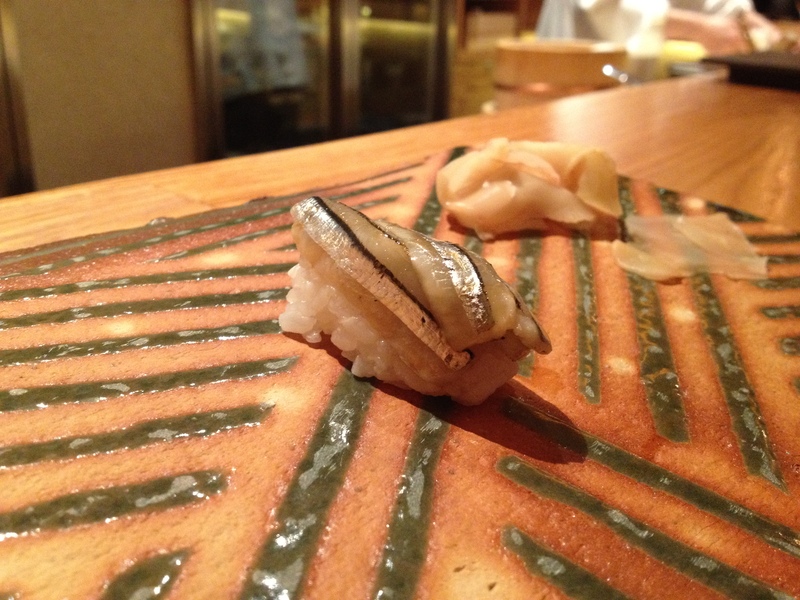 I’ve never had a sushi piece with any kind of anchovies. 5. 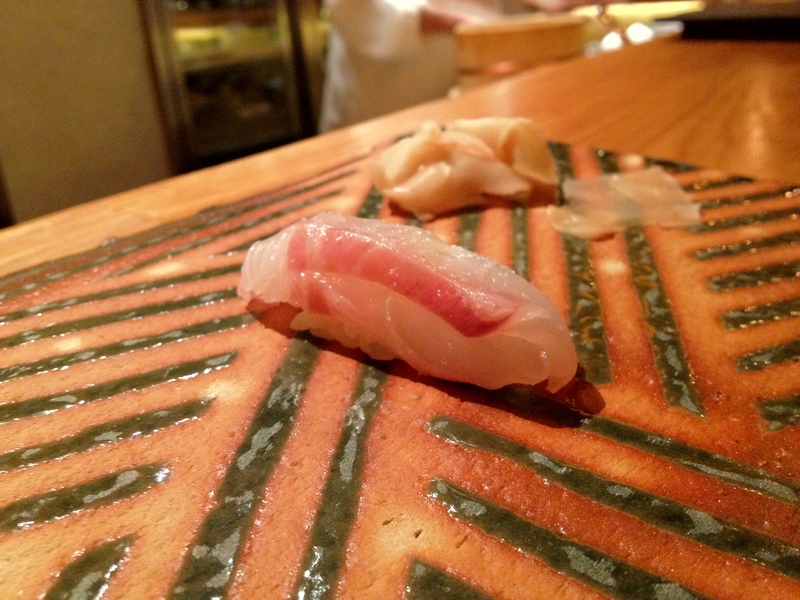 Tai (red snapper) with shiso and salt. This was gooooood–basically what happiness tastes like. 6. 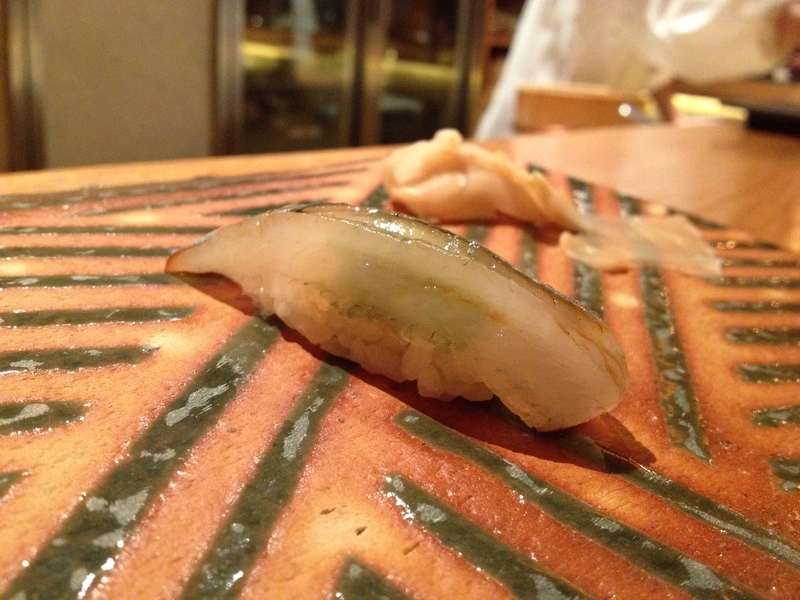 Shiraou (icefish or noodlefish). 7. 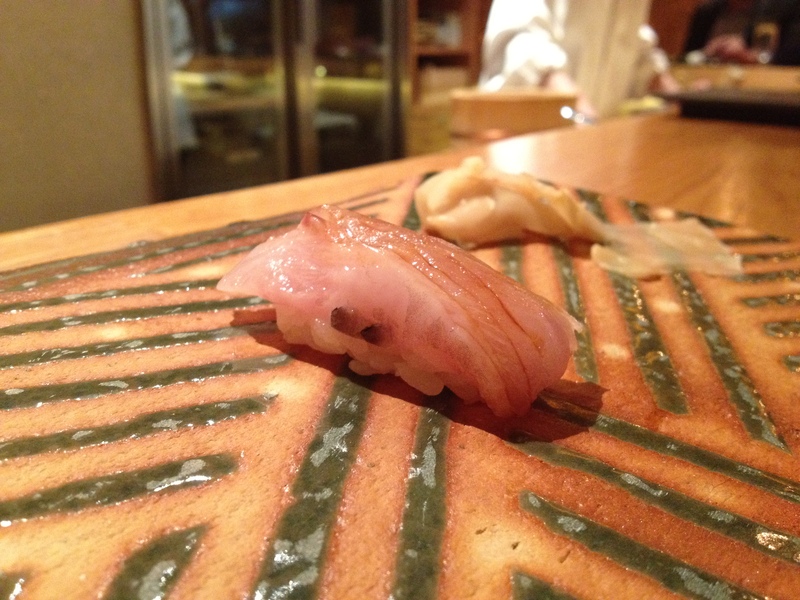 Shima aji (striped jack) belly. This didn’t melt in my mouth like I was hoping it would. 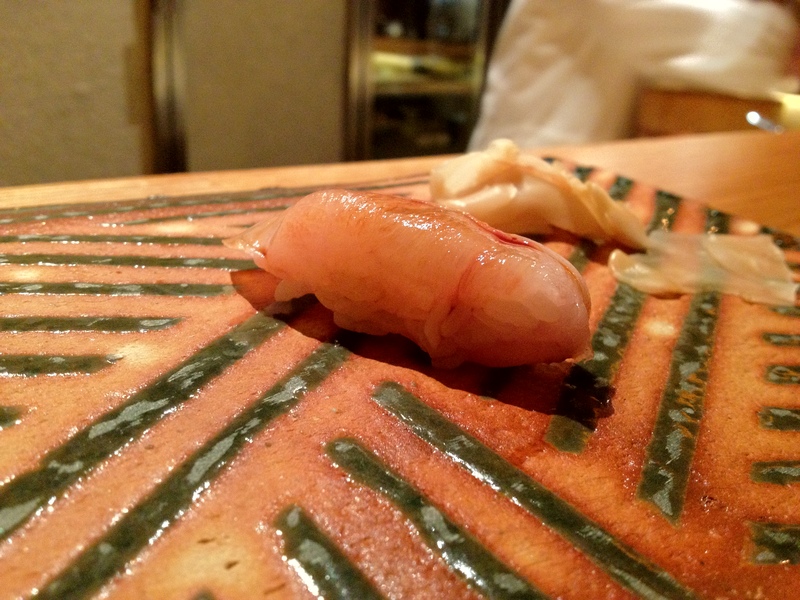 However, I’ve never had shima aji belly, so maybe it doesn’t do that. It tasted really fresh. I had this almost immediately after the akamutsu, and they tasted really similar with some slight differences. Unfortunately, I was just enjoying the pieces here and didn’t really pay attention to those differences haha :(. 10. 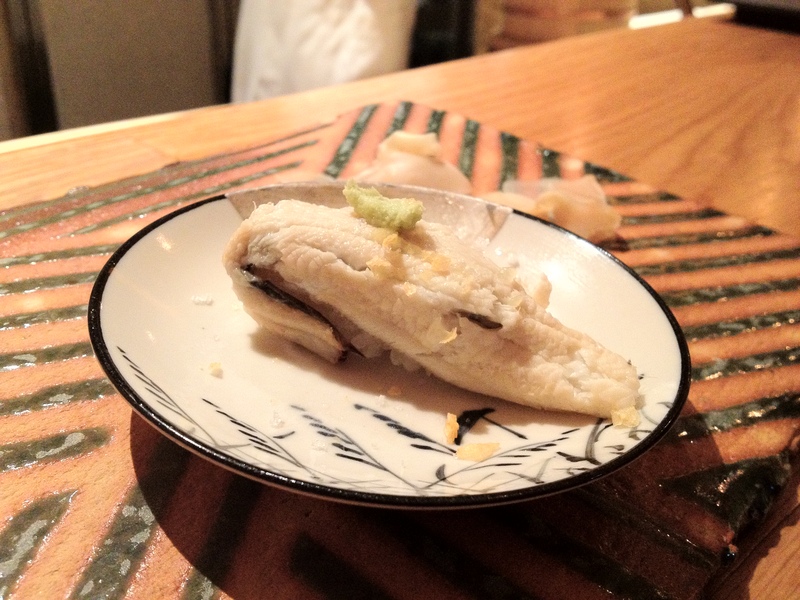 Saba (mackerel) from Nagasaki with salt and vinegar. I’m not sure the salt and vinegar were necessary. Then again, the saba taste was very intense, and the salt and vinegar definitely helped temper that a bit. 12. 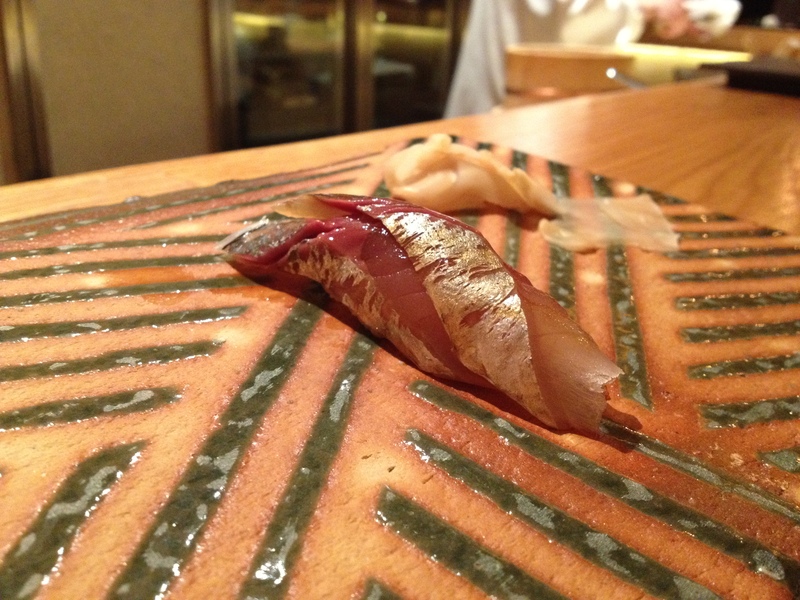 Kohada (gizzard shad) with salt and vinegar. Goooood. 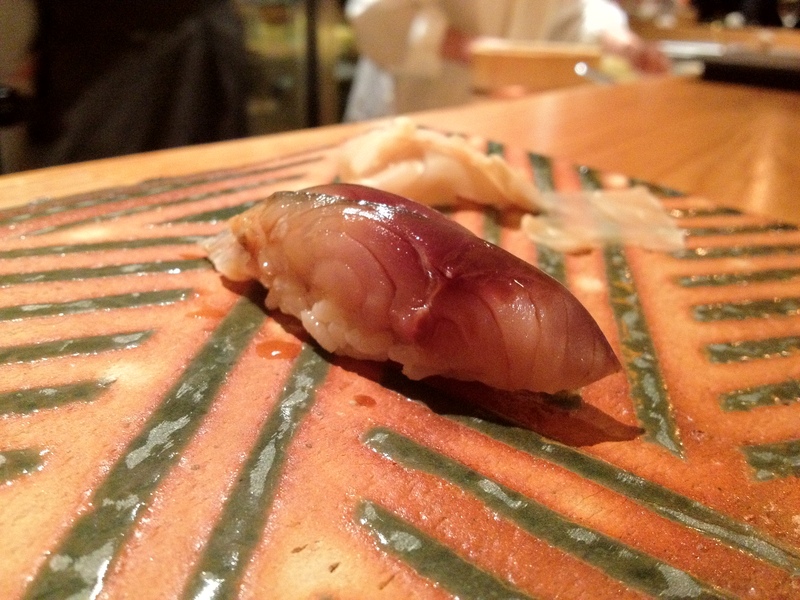 It was a little fishy as usual, but i’ve never had kohada that wasn’t at least a little fishy. The aji didn’t really melt in mouth, but it was still really flavorful. 15. Bluefin Ōtoro (fatty tuna). SO GOOD. Melted in my mouth, where an explosion of intense flavor occurred. Cue the usual statements of “This is what Heaven tastes like”, so on, and so on. 17. 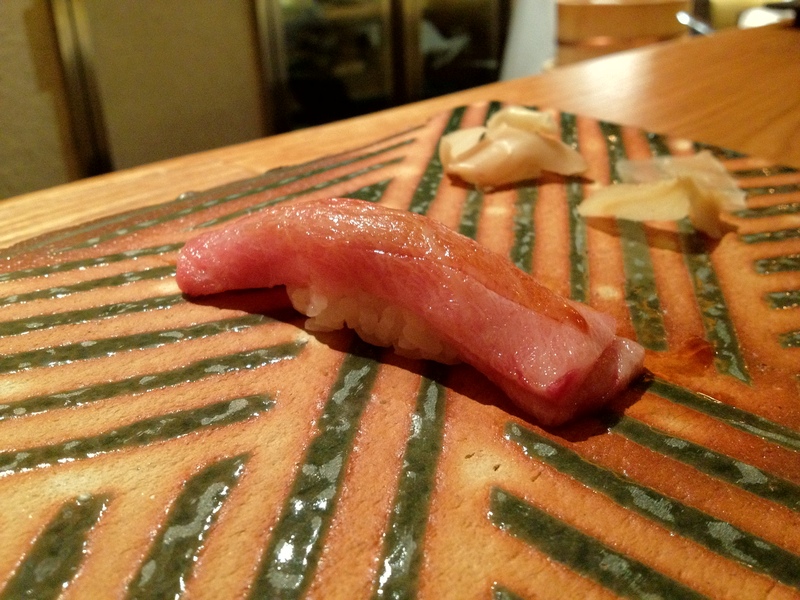 Aged chūtoro (medium-fatty tuna). HERE WE GO. Back to Heaven! This was amazing. 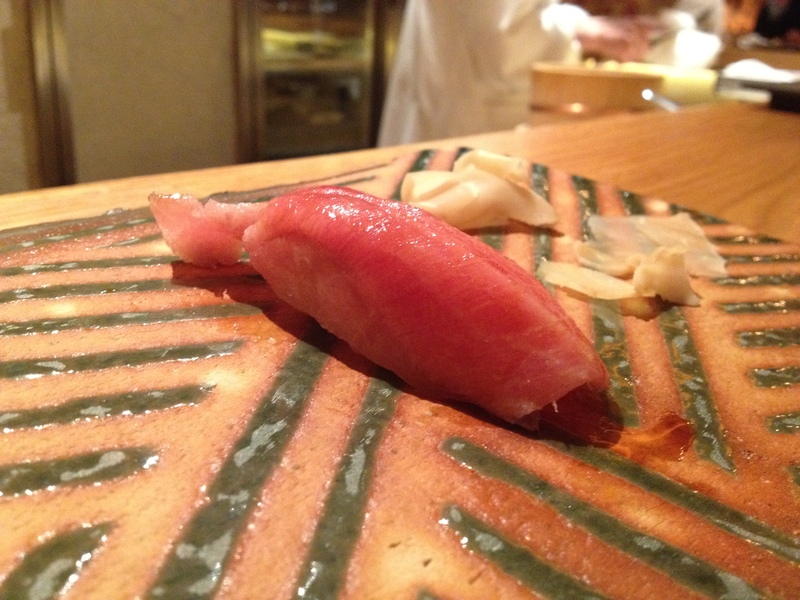 I’m starting to like akami (lean tuna) more and more, even preferring it to toro at times. This still had the fattiness and creaminess of the toro, but it also had a little of the meatiness of tuna that I so enjoy. Really similar to other really good himejako that I’ve had. 20. Hand roll with shiso and plum sauce. 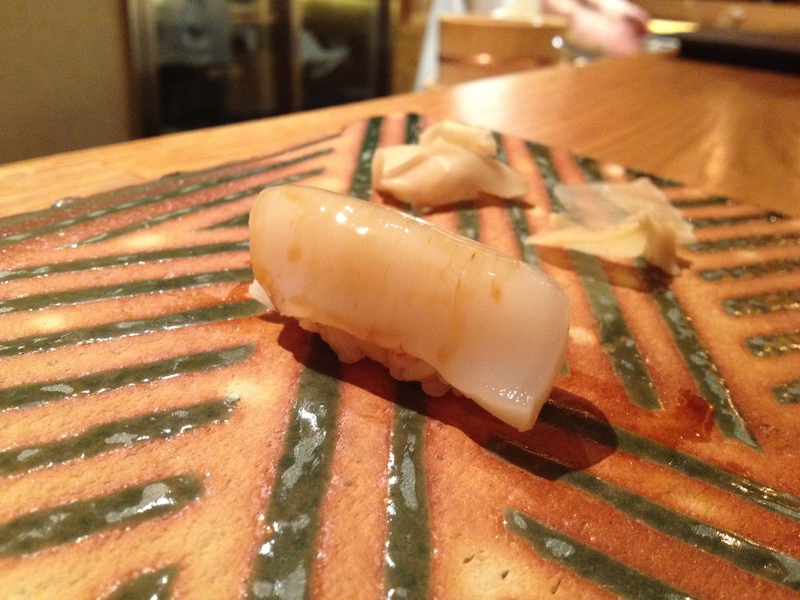 Chef Ichimura suggested that I finish the seafood with this because it would help my digestion. The seaweed was really good, and the plum sauce and shiso worked well together. 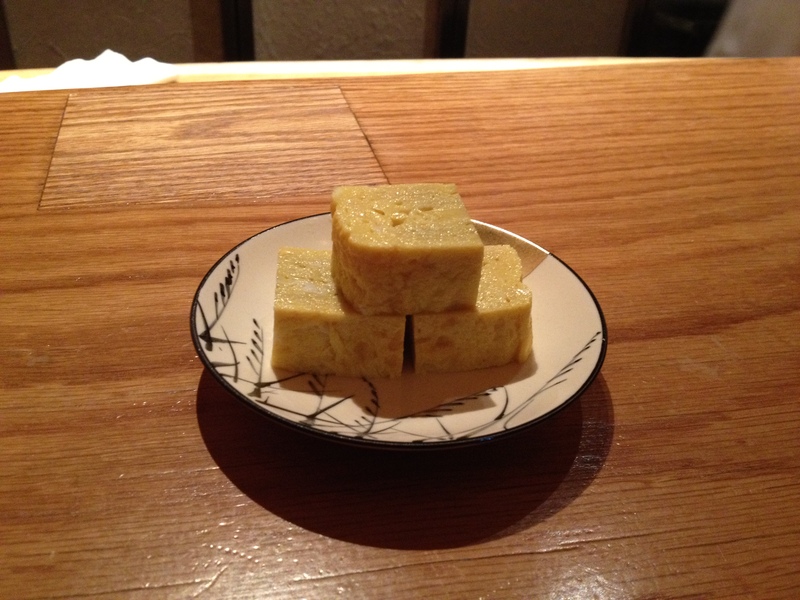 Unfortunately, the tamago didn’t really taste special at all. Seasonal fruit and sake kantern. Orange, grapefruit, red and green grapes, apple, and kumquat. Served with sake gelée.